While the ancient capital of Hanoi and the bustling streets of Phnom Penh are well worth a visit, there are many cities in South East Asia that are underrated. Hidden between mountains and along a network of rivers, the region’s smaller cities are home to some of the continent’s most fascinating sights, including the White Temple, the Mekong Delta’s famous floating markets and some of the world’s most beautiful beaches. 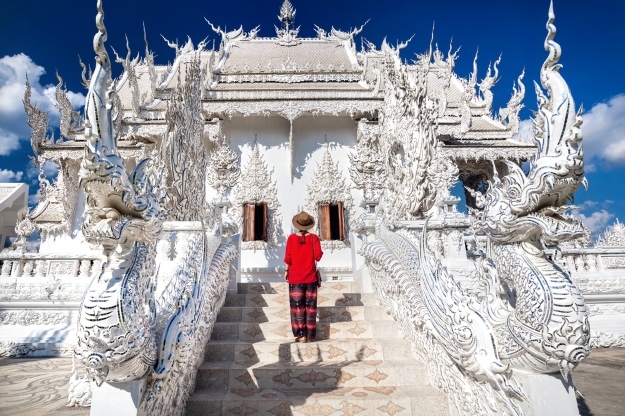 In the mountainous province of the same name, Chiang Rai is a picturesque city, most famous for being home to Wat Rong Khun, better known as the White Temple. 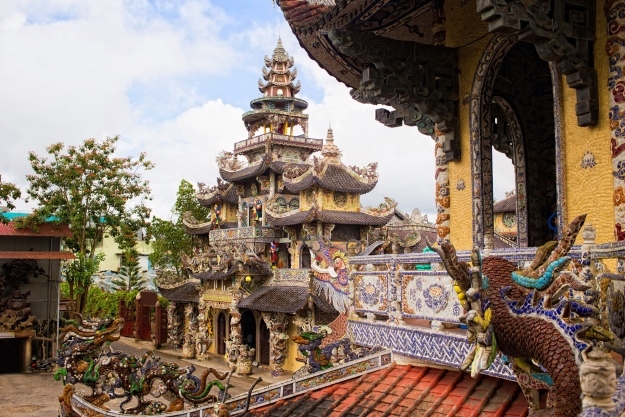 The city is close to the borders of Laos and Myanmar and although small, it is home to a stunning collection of sacred sites. Many visitors on a tour of South East Asia flock to Chiang Rai simply to try its authentic Northern Thai food, which can be found in its many restaurants and street food stalls. “We, of course, like to see the sights of any destination we travel to, but we do not travel to simply mark off a checklist. We like to feel the vibe of a place. For our readers, we provide travel stories, information, advice and tips on sights and walking tours, but include off-the-beaten-path adventures, history and culture along the way. We often veer away from mainstream tourism and in the direction of ‘real life’ seeking local experiences and traditional fare. “We absolutely loved our visit to Chiang Rai. The people are very welcoming, the temples so beautiful and the night markets/walking streets highly entertaining. Set on the Sangkae River in north-western Cambodia, Battambang is best known for its beautiful colonial buildings. Its relaxed cafes, striking architecture and picturesque riverside setting make it the ideal stop on your Cambodia tour. Although it has a population of approximately 250,000, Battambang retains a small-town feel, with welcoming locals and smaller streets, making for a comfortable day in the city. Sample authentic Khmer cuisine from food stalls and laidback restaurants, hire a bicycle to explore the surrounding countryside and visit Battambang’s many historic sites. Jarryd and Alesha, creators of Australia’s biggest adventure travel blog NOMADasaurus, loved exploring Battambang. You can visit the site of Phnom Sampeau seven miles southwest of the city. With crystal clear water and white sandy beaches, it’s little wonder why Sihanoukville is popular among backpackers. However its somewhat imposing commercial centre is at odds with this image of Cambodia’s premier beach resort. Despite its modernised centre, Sihanoukville is a worthy stop on your tour of Cambodia. 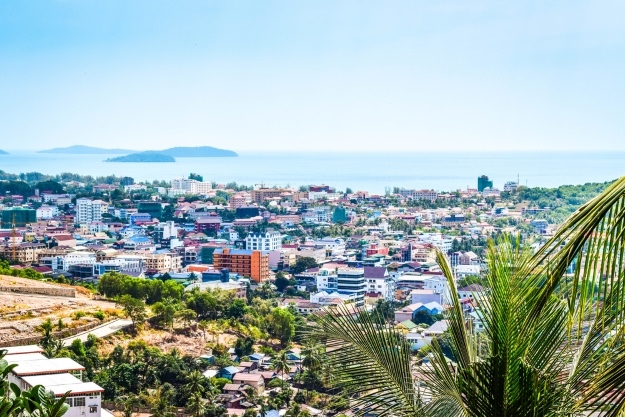 Hike to the summit of Victory Hill for unbeatable views over the Gulf of Thailand, or take advantage of the azure water by scuba diving or snorkelling. Culture vultures can explore Wat Leu Temple, which is adorned with striking features and a spectacular statue of the Lord Buddha. Although the city centre itself is not the most picturesque, its markets hold many gems, including fresh produce which you can enjoy on the beach. 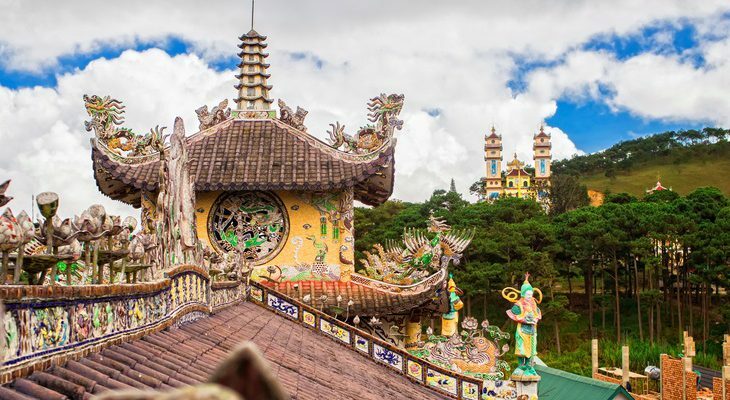 Surrounded by pine forests, hills and waterfalls, Dalat is perfect for those seeking respite from the heat and smog of larger cities. This lush city has a much cooler climate, and has earned itself the nickname ‘the city of flowers’, due to its ample greenery. Grand temples are interspersed between houses and businesses, waiting to be explored. Dalat’s flower gardens are worth a visit, providing an oasis within the city. If you’re visiting during the weekend Dalat’s night market will be open, with both locals and tourists shopping, socialising and eating from the many street food stalls. If you’re tempted by the vast wilderness surrounding Dalat, there are plenty of opportunities to get better acquainted with it. Lang Biang Mountain is just a short distance from the city centre and rises 2,167 metres above sea level. A shuttle bus can take you further to the top if you don’t want to hike the whole way. For views without the hard work, hop on the cable car to Truc Lam Pagoda, which is also home to a Zen Buddhist temple. If you have the time, the Elephant Waterfalls are well worth a visit. “Dalat turned out to be a big surprise to me. After exploring Vietnam from Saigon to Halong Bay and everything in between, Dalat was one place that instantly stole my heart. First it doesn’t even look like an Asian city – with all those neatly paved roads, quaint European style cafes and lovely colonial architecture. Famous for its floating markets, Can Tho is the largest city in the region. As the political, cultural and economic centre of the mighty Mekong Delta, arriving in Can Tho after travelling through the wilds of Vietnam can be a bit of a shock. However its picturesque waterfront, complete with sculpted gardens and cafes, provides a gentle introduction to city life. 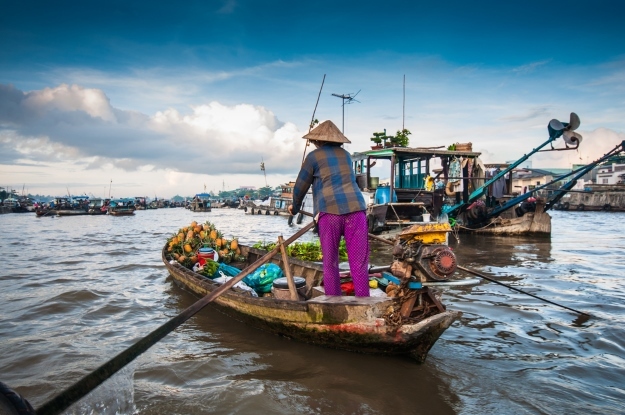 Can Tho is the ideal base for exploring the floating markets in the nearby canal network. While these types of markets are popular in most provinces along the Mekong, Can Tho’s is one of the largest. Locals gather to sell fruit and other fresh produce, starting at around 4am and continuing until 10am, when the sun rises high. Look out for some of South East Asia’s most exciting ingredients, such as dragon fruit, watermelon and yam. If you want to eat while on the floating market, simply follow the smell and look for the smoke. “Despite being much smaller than Hanoi and Ho Chi Minh City, after spending some time on the backwaters of the Mekong Delta, Can Tho felt like a veritable metropolis,” said Dave. “There are not a lot of typical tourist sites in the city itself, other than the occasional Buddhist temple, beautiful as they are – but it has a great, youthful vibe. “There is a big student population in the city, meaning that the food and café scene is vibrant and there is always somewhere to hang out or eat a delicious meal on an evening. In fact, I took a street food tour of the city and ate some of the best cuisines I had in the whole of Vietnam; a mix of typical Vietnamese fare such as hot pots or Nem Nuong, and local specialities like bánh cong or grilled field mouse. So, what were the highlights of Dave’s trip? Fortunately, you can stop by any of these underrated cities in South East Asia on one of our tours. If you decide on a tour of Cambodia for your next trip, we’re sure you won’t be disappointed with the likes of Battambang, Sihanoukville and the more famous sites of Siem Reap and Phnom Penh. 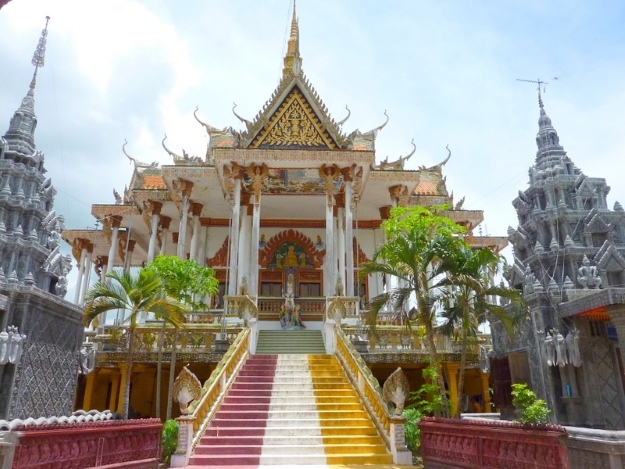 Cambodia, Thailand, Vietnam city break, sightseeing, top things to see, travel. permalink.